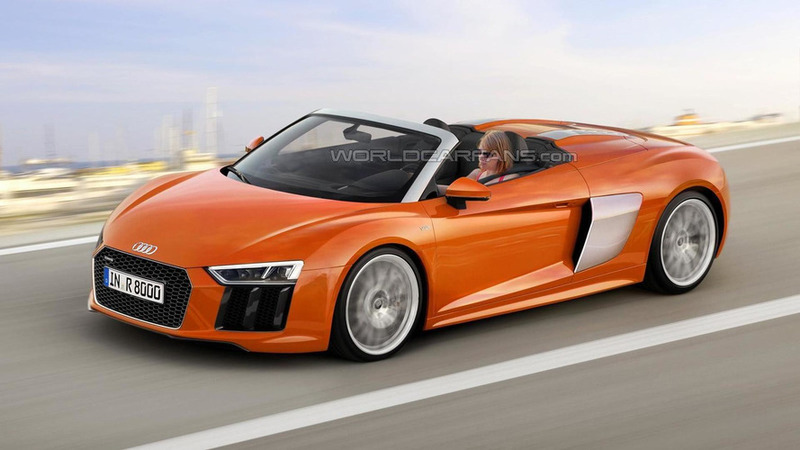 The second generation Audi R8 Spyder has been digitally imagined ahead of next year's probable introduction as a 2017MY. Audi will soon kick off deliveries of the new R8 Coupe and chances are most of the work for the Spyder has already been completed since we believe VW's premium marque won't wait that long to chop off the roof. Seen here is a very possible look of the R8 Spyder which will obviously be a tad heavier than the coupe due to the bulk added by the roof complexity. Just like with its fixed roof sibling, there will not be a V8 model as the R8 Spyder will only be offered with the V10 5.2 FSI delivering 540 PS & 540 Nm in the base model and 610 PS & 560 Nm in "Plus" specification. The extra weight will have a negative impact on the car's performances so expect the Spyder to be a few ticks of a second slower than the coupe which needs 3.5 seconds until 62 mph (100 km/h) or 3.2s for the more powerful version. Consequently, top speed will go down a bit from 200 mph (R8 V10) and 205 mph (R8 V10 Plus). It's not known at this point whether the all-electric e-tron version will lose the roof as well, but we do know from Audi the second-gen R8 will eventually receive a smaller engine, possibly a turbocharged six-cylinder while a diesel engine is being considered.